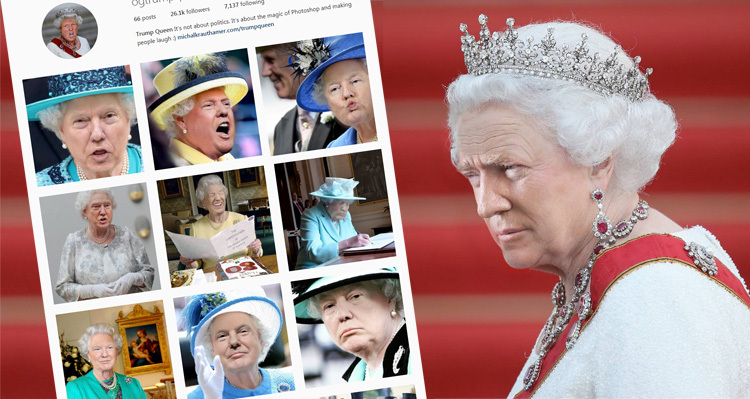 Someone is Photoshopping Trump’s face on Queen Elizabeth’s body and the results are the thing of nightmares – yet they are cracking me up. You may have been seeing photos of Queen Elizabeth’s body headed with the face of Trump floating around the internet. I started working on Trump Queen in March, one day while practicing my Photoshop skills. I’m not sure where the idea came from. But, I did one and it was just too funny, so I decided to make another one. And then another. And then another. Eventually, I had so many that I decided to post them on Facebook and Instagram to share with friends. Your Instagram account says ““It’s not about politics. It’s about the magic of Photoshop and making you laugh,” but your use of hashtags such as #donaldtrumpisanidiot, #antitrump, and #trumpsucks indicate a fairly political stance. Do you view Trump Queen as being political? I’m terrible at the internet. When I first made the account, I used popular anti-trump hashtags to get a broader reach, but I had no idea what I was doing. Now, people from both sides of the aisle find it hilarious, and I want to keep it that way! I’m happy that Trump Queen is making everyone laugh, because, let’s face it, America has been in need of good laugh for quite some time. Krauthamer continues posting new images and has added a “trumpqueen” Facebook page to share her work. You can also view her website here and her resume and her LinkedIn account here. Thank you internet for helping #trumpqueen #makeamericagreatbritainagain!! Be sure to check out the official “ogtrumpqueen” Instagram and Facebook pages to see all her images and to keep up with future posts.